I first heard of the Itadaki Street series when Fortune Street was released for Wii at the end of last year. I have yet to play that latest entry in the series, but it's been in the back of my mind since it came out. So when I saw the original (with the overly long title Itadaki Street: Watashi no Oten ni Yottette) for Famicom on Ebay for $3, I snatched it up. 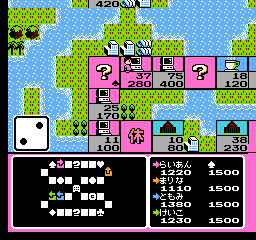 Amazingly, the game stands the test of time and offers depth and hours of fun that one wouldn't expect from a relatively obscure (at least to me) Famicom game. 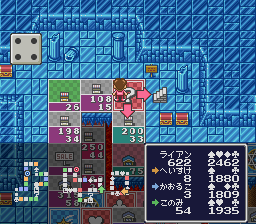 Also, by the way, it's surprisingly easy to play with no knowledge of Japanese, as there is a handy guide on Gamefaqs, though being able to read Japanese definitely makes it easier. At its most basic, Itadaki Street is like Monopoly; you move around one of five different boards, buy and sell properties, collect a salary when passing each of four chance spaces before returning to the bank, and pay rent to other players when you land on their spaces. Also, when you land on a space that you already own, you are given the option to add capital to any of your properties, which makes the rent and value increase. This is especially important because of the main aspect that sets this game apart from Monopoly: the stock market. Whenever you pass the bank, you can buy shares in any district of the board. The prices of the shares will go up or down based on how many shares are owned in that district, how many properties are owned there and how much they are developed, and also by chance space events. Investing in stocks is essential, as you can make huge profit if you manage to buy shares in an area that later ends up being developed by you or another player. Also, if you own shares in a district you will get a small bonus whenever someone lands on a property in that area, even if you do not own the property. In many cases, it is advantageous to put all your money into shares, as you can sell them and convert them back to cash at any time. Much of the fun comes when playing with friends due to the ability to make offers to sell, buy, trade, and auction properties. If one person owns three or four properties in the same district, those properties get a huge boost in value, which helps the shareholders as well, and can be turned into a mini hell for other players who must pass through that area of the board to collect that area's chance space suit (diamond, heart, etc.) to get their salary. The game ends when someone reaches the target net worth (cash plus shares plus property value), which is different for each board, and returns to the bank, or when any player goes bankrupt. In the case of bankruptcy, the player with the highest net worth at the time someone goes bankrupt wins the game. This brings up an important point: this game takes a long time to play. 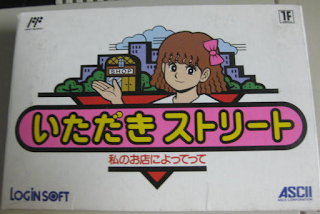 I have yet to finish a full game on the Famicom version of Itadaki Street, but it seems more likely that the game would end due to bankruptcy than to reaching the target net worth (and this proved to be the case when playing the SNES sequel). Instead, in my case, the games end when one or both players get bored (unlikely) or when someone bumps the console and makes the game freeze. The game can be played with computers or with up to three other friends by passing the controller around. 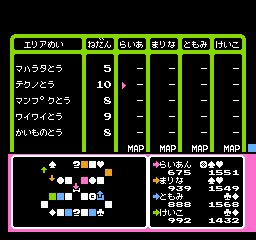 Also, Itadaki Street does have a save feature for suspending your game... if you own a Turbo File attachment for the Famicom, which is compatible with a whopping 15 different games and is impossible to find. So for that reason, you might find that you'd rather play Itadaki Street on an emulator, even if you own a physical copy of the game. The games graphics are functional and not bad considering the age of the game. Players are represented with anime-styled character portraits at the beginning of their turns and these characters will say short generic blurbs from time to time as well, in text of course. The music is also pretty catchy, though considering the length of the game, you're likely to get sick of it by the end. what appears to be the depths of hell. After one friend and I got the hang of Itadaki Street, we invited two more friends over and dove into Itadaki Street 2 for Super Famicom. Unfortunately, there are currently no guides on Gamefaqs for this particular entry in the series. 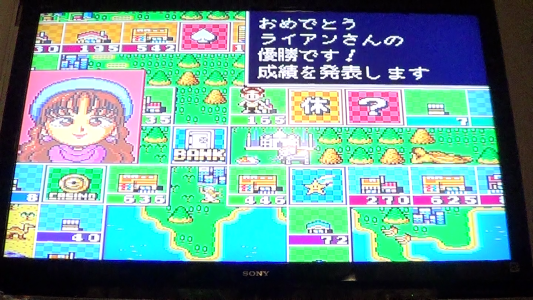 Fortunately for us, the gameplay was almost completely unchanged from the original and I majored in Japanese. Honestly, the only differences in this version are nicely updated graphics, new music (which is actually pretty great, but still gets old after a few hours), 15 new boards, new games at the casino space, the ability to save without Turbo Save, and new chance events. There's also the option to change the target net worth for shorter or longer games. So with that in mind, I'll leave it up to the reader to decide which game in the series they'd like to play. Of the three friends I played with, all three of them loved this game, played two games in a row, and then came back for more the next day, forgoing playing their new 360 in one case and an evening of swing dancing in another. Itadaki Street is fun and addicting; I can't recall the last time my friends and I have spent this many hours playing a single game in such a short time. It's a perfect example of the potential that video games offer, which far exceeds that which is possible with a traditional board game. 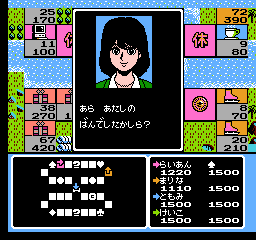 There's no reason to play Monopoly any longer - play Itadaki Street instead. Update: I've now made an English translation guide for Itadaki Streeet 2! Check it out!